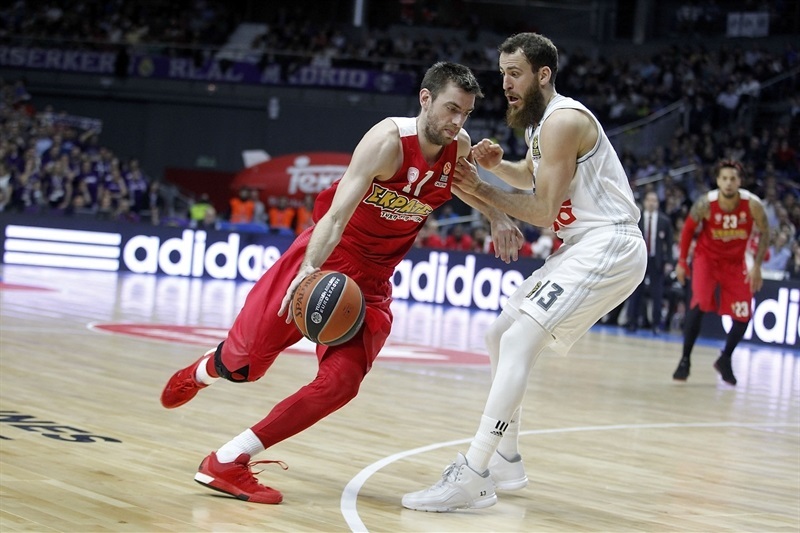 In the Game of the Week, Real Madrid bested Olympiacos Piraeus 84-72 at home in the Barclaycard Center, on the same floor where it beat the same Reds in last season’s championship game to lift the Turkish Airlines Euroleague title. Madrid improved to 3-2 in Group F, while Olympiacos dropped its third consecutive game and now holds a 2-3 record. The lead swung back and forth in the first half before Real Madrid made a 12-2 run to end the second quarter and go into halftime with a 41-35 dge. 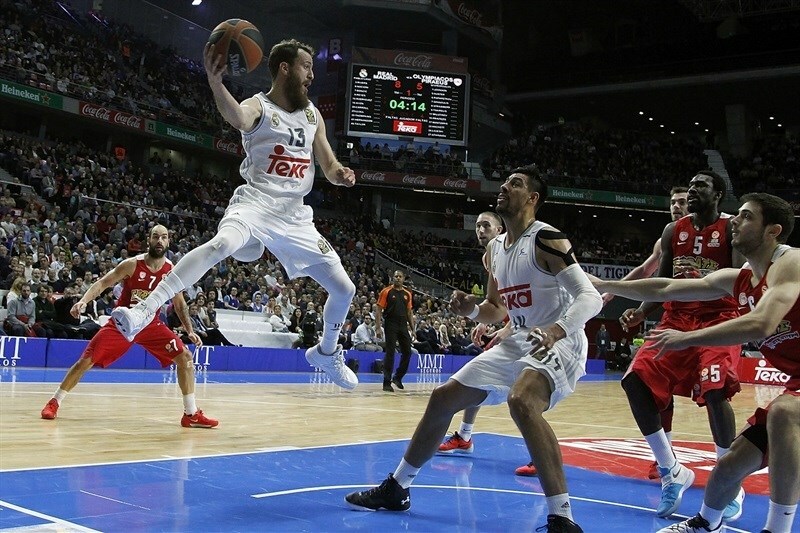 After the break, it was first Sergio Rodriguez that fueled a 13-0 third quarter run with a pair of three-pointers, before Sergio Llull took over in the fourth quarter, scoring 11 of his 18 points in the finals six minutes of the game to seal the deal. Llull also dished 7 assists, while Gustavo Ayon collected 11 points and 10 rebounds. 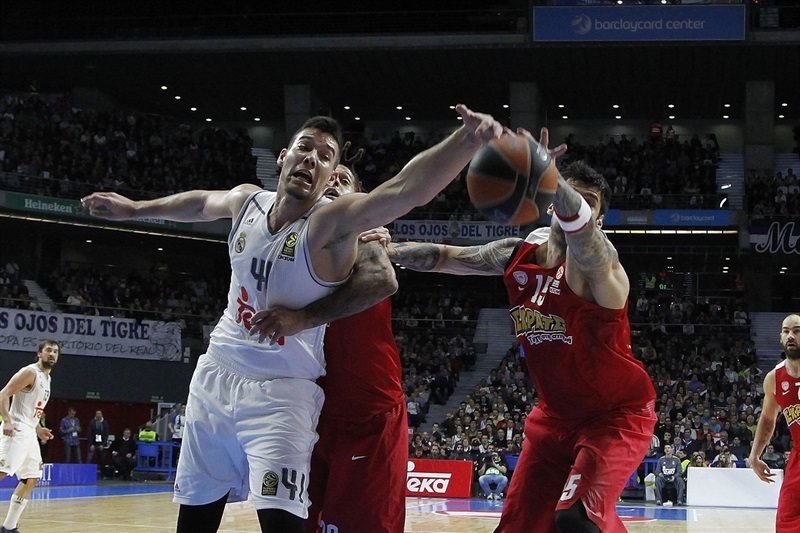 Felipe Reyes and Rodriguez also scored 11 apiece and Andres Nocioni chipped in with 10 for the champs. 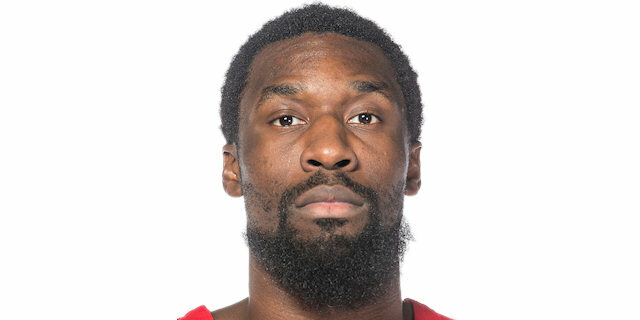 Othello Hunter amassed 14 points and 11 assists for Olympiacos. Daniel Hackett also netted 14 points and Ioannis Papapetrou scored 12 in defeat. To start the scoring, Llull made a pair of free throws and drove the lane for a layup. Matt Lojeski, back after missing six games, hit a triple for Olympiacos, but Rodriguez made a tough runner, then assisted Reyes for an easy layup and an 8-3 start. 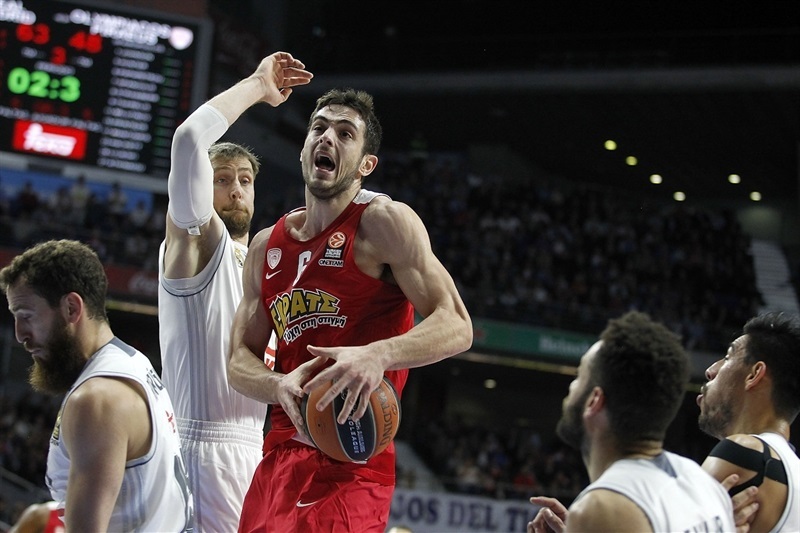 The visitors used defense to facilitate offense, using Madrid's turnovers to get fastbreak layups from Vangelis Mantzaris and Lojeski to get within 1. Hunter and Jeffrey Taylor traded baskets inside, before Ioannis Papapetrou hit from long range to tie things at 12-12. K.C. Rivers scored from close range, before Hackett and Andres Nocioni traded threes to make it 17-15. However, free throws from Papapetrou and Hackett in the final 70 seconds of the quarter made it 17-19 after 10 minutes. Jaycee Carroll knocked down a triple, and Willy Hernangomez scored inside for Madrid, before Lojeski drove for a layup to make it 22-22. Carrol nailed another three, and Hernangomez added a tip-in, however, Georgios Printezis hit a triple and made a tip-in, giving the Reds a slim 27-28 lead. 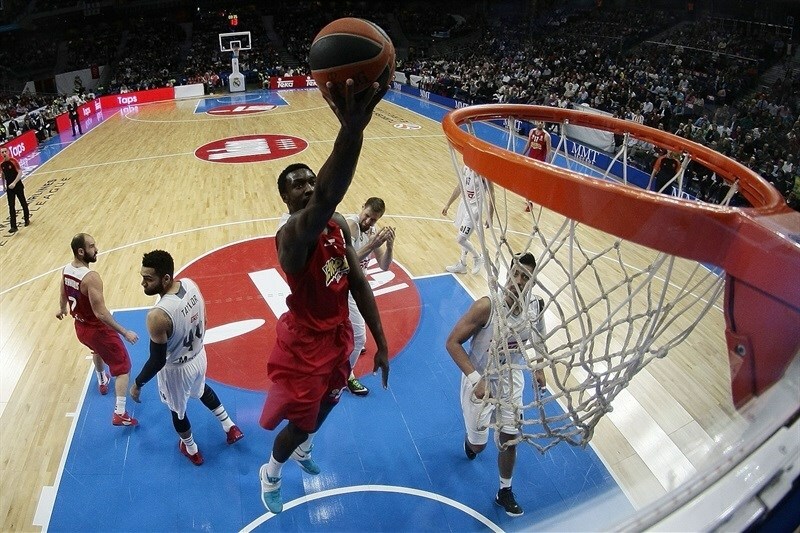 Trey Thompkins made a short fadaway jumper, but Hackett dished a pass for a dunk by Milutinov, then Hackett buried a triple to give Olympiacos a 29-33 advantage. After a timeout, Madrid replied with Ayon inside scoring outside, and Carroll hitting his third shot of the quarter from the outside to make it 34-33. After an Olympiacos timeout, Ayon had a basket inside, and after Hunter scored a put-back for the visitors, Reyes nailed a triple, then got a favorable bounce on an open mid-range jumper, capping a 12-2 run and making it 41-35 at halftime. 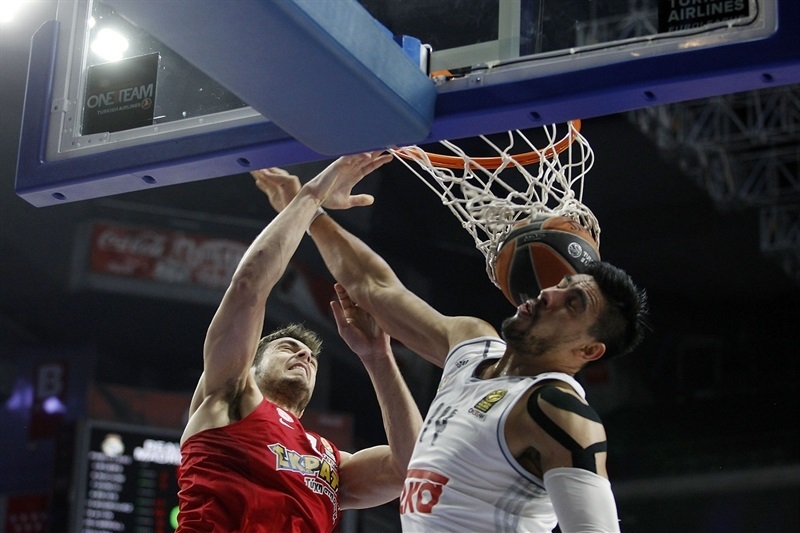 Rodriguez made a step-back jumper to open an 8-point margin, but Strawberry hit a corner three-pointer, and Milutinov banked one in from close range to get Olympiacos within 43-40. Reyes answered with a put-back, and after a span of two minutes without a basket, Rodriguez knocked down a triple in transition to open an 8-point advantage. After an Olympiacos timeout, Rodriguez buried a shot from way downtown for the first double digit lead of the game. Lull followed with a three of his own and then ran a fast break only to dish it for a Reyes layup and 56-40. Papapetrou snapped a 13-0 run with a huge dunk in the lane over Ayon, but Ayon made a floater of the glass on the other end, before free throws from Rodriguez and Rivers opened a 61-43 margin. The visitors scored only one field goal in exactly seven minutes before Mantzaris drove for a layup. Rivers scored from close range for the hosts, and Hunter made a pair of free throws to make it 63-48 after three quarters. Papapetrou made a long jumper, and Spanoulis fed Printezis with a nifty pass and an easy layup, which cut the deficit to 63-52. 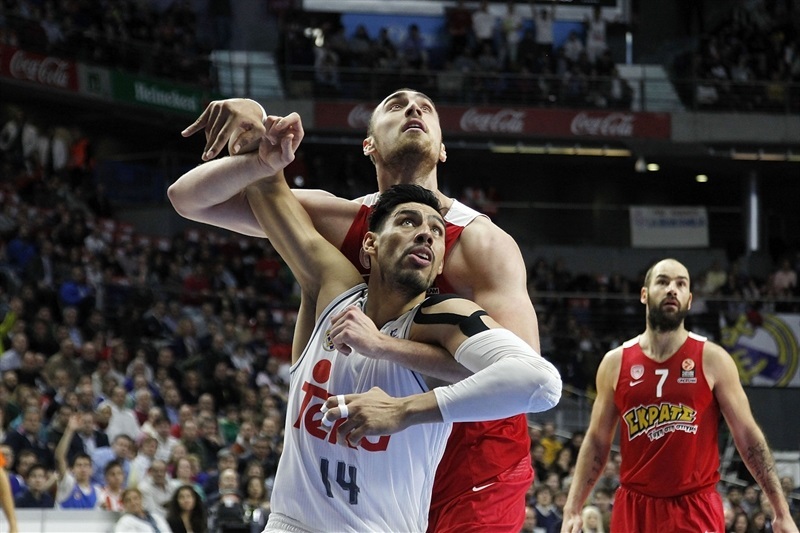 Madrid needed almost three minutes to score before Nocioni hustled for a put-back, and Ayon followed it with a second-chance three-point play to make it 68-52. 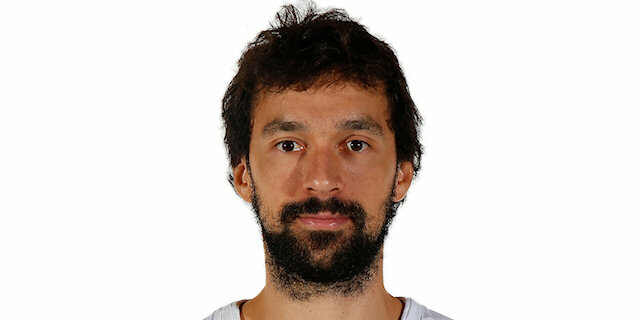 Hackett hit a jumper with his toes on a three-point line, but Llull bettered it, banking in a high-arching acrobatic triple to give Madrid a 71-55 cushion midway through the fourth. A minute later, Llull hit another tough triple, this one from the right corner, opening a 19-point lead. Hackett hit his third three-pointer, and Hunter had a pair of baskets inside in a 0-7 run. After a Madrid timeout, and with a game winding down, Nocioni and Papapetrou traded shots from downtown, before Llull nailed a mid-range jumper to make it 79-65. 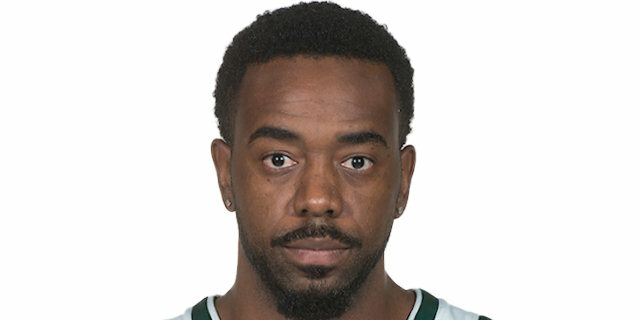 Hunter made a reverse layup for the Reds, and Mantzaris knocked down a three-pointer that helped visitors get within 81-72 in the final minute. Lull rounded out the scoring, driving for a layup-plus-foul to make it a 12-point margin at the end. 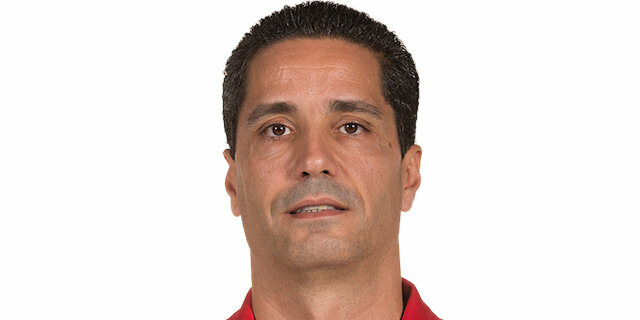 ""First of all, congratulations to my players for the win, especially coming off a last-second loss. We had four out of five games at home until now, but the Top 16 has 14 games and we still have to play nine of them, no matter if we play at home or not. I think we did a great job on defense for many minutes. Our defensive work was very good, not only on the players who guarded Spanoulis - Sergio and Jeff; but also the rest of the team. They scored 48 points in the first three quarters and tried to play with more rhythm after that, finding some open shots, which allowed them to reduce our lead in the fourth quarter. We were thinking of keeping an advantage rather than controlling the rhythm of the game. In general, I am happy - it is probably not our best game, but we had fewer mistakes that we were struggling against in other games. Looking back to the game against CSKA, I think we gave them away a lot on offense and defense. In that sense, we did much better today, having a much better balance all 40 minutes. I think we played a very serious game. We had a bad moment in the second quarter, in which they took us out of the game with their physical game, playing on the verge of committing fouls, but we were able to return to the game and move the ball very well. We managed to make the most out of our shooters' momentum - Sergio Llull, Sergio Rodriguez and Jaycee Carroll. We read their defensive switches and I am very happy with the way we played offense. Of course, I am happy with the game plan we had on defense, which, I think, was very good." "Congratulations to Real Madrid for the win. They played well, especially in the second half. I believe that the rhythm of the game was very important to determine the winner. We controlled the tempo only in the first quarter, when we played good defense and forced Madrid into bad shots. That gave us the chance to run the open court and score some easy layups. We also controlled the rhythm at the beginning of the second quarter. We led by 4 late in the second quarter, but after that, we lost our concentration and that was a crucial moment. Madrid is a team that will punish every mistake you make. They scored some easy transition points and got a lead that was bigger than we should have allowed them. 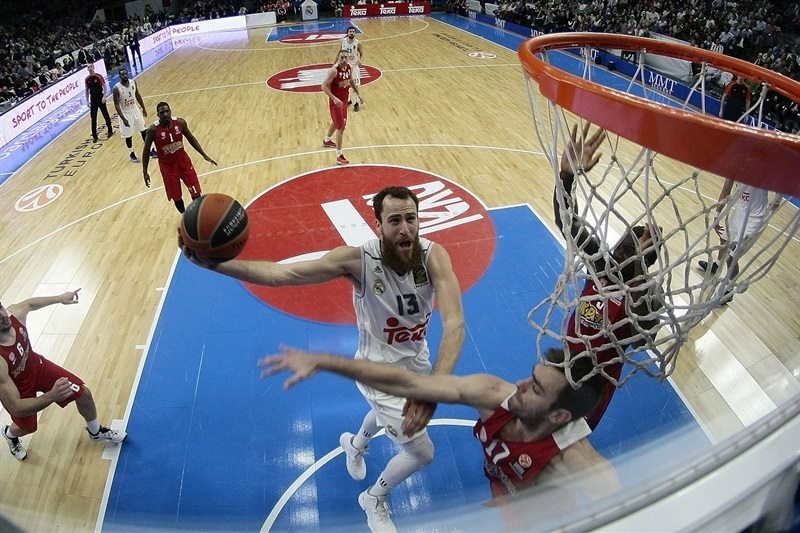 In the third quarter and the beginning of the fourth, the game belonged to Real Madrid. We tried to come back, but didn't succeed at controlling the boards. They got some easy points from offensive rebounds and some easy points from transitions. This is their style and the difference went up by 20. After that, we tried to do our best and cut down the difference. We need to continue to work hard and have to think about our next Euroleague game to be more competitive and more aggressive to win games again." "This is definitely a big win for us. It was tough, they came out and played physical, but we made some tough, tough shots and had some toughness on defense. That kind of was the turning point for us, the third quarter that we had. We really locked down defensively and pushed forward. Tonight, it was our game and we took control in the third quarter. I feel fine, I had some good games, I am getting into the groove. I am perfectly fine with what is going on, contributing and doing that I can do to get wins." "I am feeling better, but not 100% yet. I believe that that our medical staff did a great job and that allowed me to be back in record time. I will try to help my team as much as I can. We did a good job, especially on defense, all of us. We controlled the boards and in the end we got the win that we needed." "It was a very tough game. We played very good defense in the first half, but after that, we did everything we could to stay in the game, but couldn't do it. I think we gave everything we could, but had to give a little bit more."